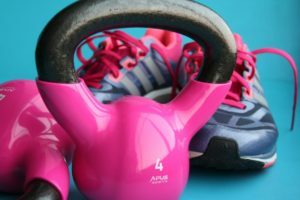 Though it would be great to get some Dumb Bells, a Skipping Rope or even a Kettle Bell to enhance your exercising routine, it’s not a definite ‘must’ to use equipment to lose weight and tone. I just added the simplest way for you, this way it won’t be that easy to be discouraged. However, I do have the below equipment that I bought from amazon.com. They help in the long run when switching and enhancing routines. These methods I listed was routines I used from two different fitness trainers. Of course, It is a bit harder with a trainer because of they add more pressure to the workout. Well I like easy and simple I hate doing exercise with technicalities, and my poor body is unable to twist, turn and doing technical work-out routines. I have done simple exercise and lost a lot of weight, hence working like a beast is unnecessary. I personally do not like to work-out or leave the confinements of my home to go to the gym. I know I am a lazy bum. But to have a simple exercise routine that is not too technical and allows you to see results then I will take that any day. I will be doing these exercise after Christmas of course along with proper nutrition, and I will update you with the results and post my diet plan on a different blog post just for you. Let me know what you think and if you are interested in joining me.